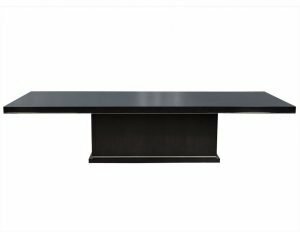 This modern deco style cocktail table is part of the Original Ralph Lauren collection. 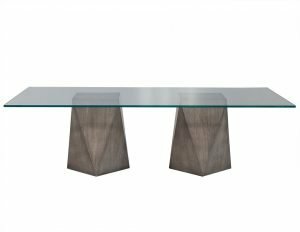 Crafted out of rosewood and parchment, this piece has a large glass top and two u-shaped lacquered wood ends with metallic wood pieces for supporting the glass. There is also a large lower shelf with a leather-like tile finish, making this a perfect centerpiece for a fashionable home.